Enshin Karate is unique for its blend of circular strategy, rhythmic punching and kicking attacks combined with sweeping and throwing finishing techniques. Enshin is particularly well-suited to street encounters against multiple attackers that require the ability to respond quickly and flexibly to different opponents attacking from various angles. 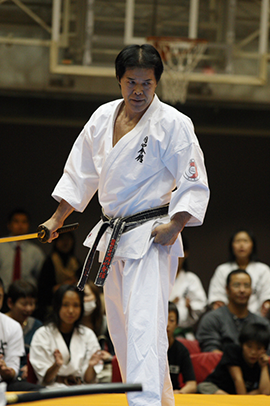 Kancho Ninomiya's strategies have proven highly successful in the Sabaki Challenge, and his innovations have been widely copied. However, not until the 1997 publication of his book called Sabaki Method did karate enthusiasts have the opportunity to explore every facet of Ninomiya's strategic fighting system. Sabaki is a Japanese word that means "usefully redirecting a force." It describes breaking a horse or damming a river: turning natural energy into productive force. 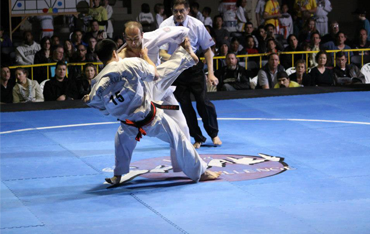 In Enshin Karate, it applies to turning an opponent's power and momentum against him. Many Enshin techniques are based on moving to the outside of an attack, pulling the attacker off-balance and finishing him with a sweep or throwing technique that inevitably puts him on the floor. Enshin training is extremely dynamic and can be compared to a high intensity cardio workout. Our system, however, is more challenging and helps you develop a strong knowledge of human body mechanics and movement. Enshin Karate is one of the most practical styles of martial arts and helps you overcome any challenging situation. It has a very unique and effective approach that distinguishes it from and gives it a strong advantage over other martial arts. If you are a black belt from any other style and are looking for a new level in your training, Enshin Karate is one of the best choices. In fact, among our students we have black belts and advanced students from Taekwondo, Judo and Karate, Kung Fu and other arts. The name ENSHIN is derived from two Japanese words: “en” meaning 'open or unfinished circle' and “shin” meaning 'heart' or 'inner.' The combination of these two words and their meanings embody the most important aspects of Enshin Karate. For me, above all else, the 'inner circle' of Enshin Karate represents the strong bonds that keep us together. The strength of this organization depends on the ability of each of us to listen to our hearts, and to relate to others through it. The middle ring in our logo represents the cycle that is the essence of our training as well as life. In training we begin as a white belt, and move through the darkening belts before becoming a black belt. When we achieve the black belt we begin anew. So, too, in life. Each goal we reach marks a new beginning. 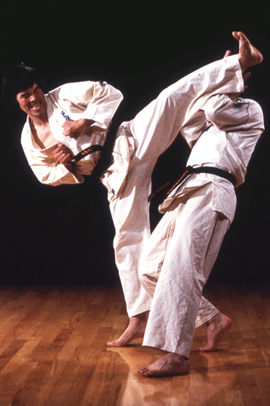 Taekwondo: As often seen in Taekwondo training and competition, kicks are the primary technique in this style. It is only suitable for a far range of combat when you can kick your opponent and stay away. Taekwondo is extremely vulnerable in close combat where a practitioner is within the reach of punches. It is totally useless in a small space like an elevator or when one gets involved in a grabbing/grappling situation. Traditional Karate: Mostly teaches ancient linear rigid impractical movements and techniques. Usually it is limited to relatively weak punches and kicks only that can be easily blocked or evaded. Judo and Jujitsu: These styles are mostly developed for a close range situation and are useless till one can grab an opponent. Grabbing, throwing, but not punches or kicks. Boxing: A very good and dynamic fighting approach that is limited to punching only. It lacks kicks and grabbing control of an opponent.